Are PF Flyers Made in the USA? 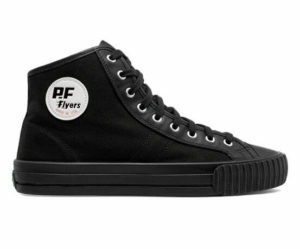 Founded in 1937 by B.F. Goodrich, PF Flyers is one of the original American sneaker brands. They have been incredibly popular among kids for decades, often known for their enticing slogan of “Run Faster, Jump Higher.” For the younger generation, these shoes were made famous by the movie The Sandlot and the character Benny “The Jet” Rodriguez. Today, they are owned and manufactured by New Balance, who purchased them in 2001. We already investigated New Balance shoes and where they are manufactured – do they treat PF Flyers the same? After doing some digging, we got to the bottom of everything. Our verdict is below. Verdict: Are PF Flyers Made in the USA? Yes, some models of PF Flyers shoes are made in the USA. However, their Made in USA collection is only a limited portion of their total production. Similar to their parent company New Balance, only a portion of PF Flyers are actually made here. For those shoes that are American made, each pair is constructed in their factory in Boston, Massachusetts. We really appreciated that they are all in the same place on their website (link below), which makes it easy for us to separate the locally made pairs from ones that aren’t. Additionally, each Made in USA pair is marked on the interior of the shoe, along with the zip code of the factory in Boston. Make sure to pay close attention to those labels – some styles have both a Made in USA line and a non-domestic line (not labeled as such). Below, we break out which pairs of PF Flyers are American made and which are not. Surprisingly, their “All American” style doesn’t look like it’s made here, so watch out for that as well. Are New Balance Shoes Made in the USA?